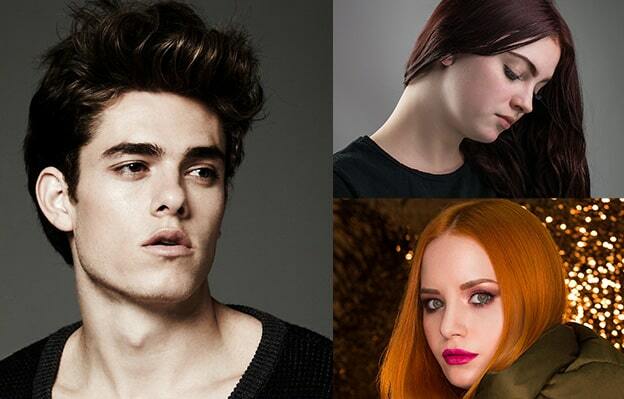 Belegenza is proud to present Cheyenne Evans, Makeup Artist. Revealing gorgeous hair is our specialty, and in the process, we also discover and reveal talent that shines through as well. As we’ve made it up and down the salon and studio circuit, we have the privilege of working with entertainment’s finest Hair Stylists and Makeup Artists. As we present our products, and train stylists in using them for the best results demanded by the top celebrities, we get to work with the finest in the industry! It’s pretty obvious in this circle that extreme talent is a prerequisite. Then, there is another set of distinctions that make certain ones stand out above the rest. And so it was, and so it is… She has catapulted herself from a dream to already doing makeup for Red Carpet Events! In her words…..
“Well, I was born January 23, 1996 in a tiny town in Michigan. I always grew up watching horror movies and I was always so intrigued by the monsters and how they were made. Fast forward to 2011 when Face Off premiered on SyFy, I was finally able to see how it was done. It sparked something in me. I wanted to make monsters for the movies. After playing around with Special Effects makeup, I discovered beauty makeup and decided I wanted to do both. My mom and I came out to Hollywood on vacation and I decided this was exactly where I wanted to be. I vowed I would do anything I had to in order to move out here in 6 months. I sold off everything I owned, had to find a home for my horse, and packed up me and my 3 cats in my car; 5 months after my first time out here. I searched everywhere for a job serving(it’s what I’m good at lol) and finally got a call back from Mel’s Drive-In. Cheyenne has been working with us for a very short time. In a matter of months, we’ve connected her with the top names in the Local 706, working with them in philanthropic makeover events for HomeLight Family Living, worked with celebrities at the Hollywood Show, and now, even doing Cheryl’s makeup for the coveted Makeup Artists and Hair Stylist Awards 2016 red carpet event! Slated for many events this year, her look-book is growing leaps and bounds as well. Not only is Cheyenne talented, she’s a lover of Belegenza! 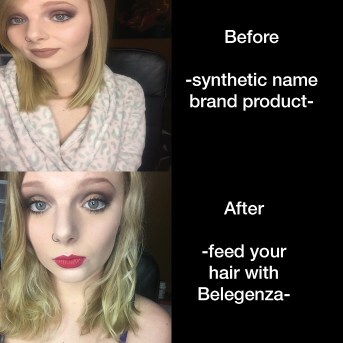 Look at her own before and after showing her hair before with top brand name products, and then after feeding her hair with the natural perfection of Belegenza! Makeup Artist, Cheyenne Evans, lover of Belegenza Natual Hair Products, shows her hair as she makes the switch to natural! Johnny Depp and Hairstylist Lifetime Achievement Award Recipient, Yolanda Touissieng at 2016 MUAHS! Alan & Cheryl at Makeup & Hairstylists Awards, makeup by Cheyenne Evans. Alan, Cheyenne, and Cheryl behind the scenes before the Makeup and Hairstylist Awards 2016! Finishing makeup touches by Cheyenne Evans on Cheryl Honc of Belegenza. Hair by Alan Eschenburg.